This seminar provides an introduction to boating for crew members who need basic information and who may or may not have taken a boating course. 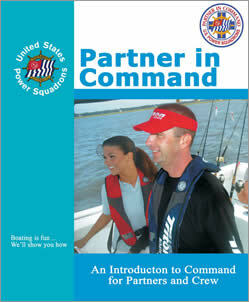 It is designed to provide essential information one may require to assist a skipper in the safe operation of a recreational boat. Included in the seminar are actions in response to emergencies. This seminar includes a text. A Knot Board will be useful to practice tying knots. Partner in Command may be taken in a squadron-run session or as a fully interactive online learning experience. Either way, this comprehensive seminar can be completed in 2-4 hours. See the trifold brochure (3048KB, PDF) for more information. Locate a Seminar near you or take this seminar on-line at your convenience!